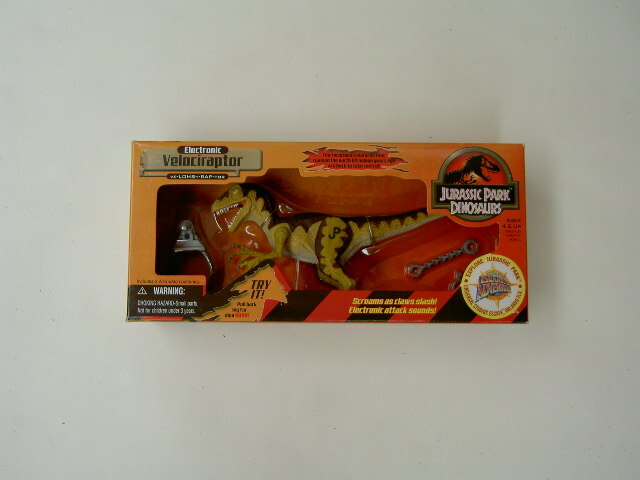 Description: the electronic Raptor of the first JP Dinosaurs line sports a wholly different paint job than the regular Raptor figures of this series. Its back, topside of the tail, neck and upper part of the head are painted dark brown. This colour is also found on the sides of both upper legs. Triangular shapes run out of this colour over the rest of the body. The flanks, sides of the tail, rest of the legs, arms and most of the head are coloured dark yellow. The belly, throat and lowest part of the tail are painted beige. The creature has grey claws on both hands and feet, including the infamous sickle shaped claws on the feet. It has light yellow eyes with cat like black pupils, white teeth and a red tongue. The edges and inside of the mouth are also coloured red. On its left upper leg the figure sports a black JP logo. This Raptor stands in a fully neutral pose, with its long tail slightly tilted up. It has a more robust look to it compared with the regular Velociraptors of this line and has a bigger, rounded head. Its mouth is opened and can’t be closed. Unlike with most other Raptor figures the claws on its hands are turned inward as if the beast is holding something. This was most likely done to make the creature look more menacing when the attack action is activated, and to help them grab other figures. Pulling the creature’s legs back (or pulling only one leg back, as the legs are interconnected) makes the arms move away from each other as if the Raptor is preparing to strike. Releasing the legs causes the arms to revert to their original position like the critter is clutching some prey between them. Activating this strike action also causes a loud attack scream to be heard. This Raptor comes with three different pieces of capture gear. There's the typical cuff like tag with the JP logo on it, as well as an arm piece that can hold both arms together. The big third piece can fit over the Raptor's back. All three pieces are painted shiny metallic grey. Analysis: this line doesn't only return old and familiar regular dinosaur faces from the classic days, but also some electronic ones, including this repaint of the often fondly remembered JPS1 Electronic Velociraptor. The sculpt has not been changed and comes with the same effective attack option as before, trapping unfortunate human figures between its arms, while producing a terrifying strike shriek. This sound has been greatly improved and is now very noisy, adding to the figure's overall intimidating feel. It's much louder than even the JPS2 Utahraptor sound, which was the same shriek but didn't sound loud enough to come over as really frightening despite that figure being a huge awe-inspiring Raptor. This JPD1 figure basically tells us what the Utahraptor's shriek should have sounded like. The paint job of this electronic Velociraptor copies the paint scheme of its predecessor but uses harder colour contrast making the used colours stand out more. It's not a very original paint job (in fact, it's largely identical to the one featured on the regular JPD1 Wave 1 Raptor figure, which does add some consistency to this toy line), nor are the used colours very appealing together. Details, however, have not been omitted. Painting both the inside of the mouth as well as the edges around it is new for this line and a definite nice touch. The eyes could have used a different colour than yellow though, since the rest of the face is mostly the same colour, so they don't stand out much. Unlike the original JPS1 Electronic Raptor, this figure comes with capture gear. None of the three pieces were designed for it of course, but at least they fit. The arm piece works pretty well, and even provides some dinosaur-breaks-free-of-restraints action. Pulling the legs back causes the arms to separate, which often (not always in one take) makes the arm piece detach as well. The tag is just the standard little nuisance, the sort of thing people keep misplacing, severely annoying collectors who try to get the figure complete when in loose condition, all the while not having any real function but to tell folks this is a JP figure, which of course anybody can see by the JP logo on the figure's left leg. The big back piece is an odd addition to the set. Though it fits, it doesn't really restrain anything. Originally a head piece was attached to it, but that didn't fit on this Raptor so they discarded that. Now it just sits there on the figure's back, feeling (and being) out of place. Repaint: yes. This is a repaint of the old JPS1 Electronic Velociraptor, with repainted (and in the back piece's case, slightly retooled) capture gear from the TLWS1 small Pachycephalosaurus and TLWS2 Ornithosuchus figures, as well as the typical tag found on many dinosaur figures from various JP toy lines. The figure would not be repainted again. Overall rating: 6/10. It's still a decent Raptor sculpt with excellently enhanced sound FX, but the paint job and capture gear aren't the best around. This is probably the most common electronic dinosaur figure from this line, but still not necessarily an easy find, especially MIB or complete.